What did you expect? With that luscious 2560 x 1600 display and 300ppi pixel density, how could both versions of the Google Nexus 10 not sell out? The 16GB model of the tablet is now all sold out, as is the 32GB version as well. Did someone say the economy is still doing poorly? And wait, there's more. Of course, the Google Nexus 4 sold out on the Google Play Store shortly after being offered on Tuesday, (although a trip to the right T-Mobile store could help you here, that is if you don't mind paying $150 more for the same phone) and the HSPA+ variant of the Google Nexus 7 is also out of stock. Some of those who ordered the Google Nexus 4 received an email on Thursday, telling them that the device is on backorder and could ship sometime in the next 3 weeks. Anyone surprised by this? 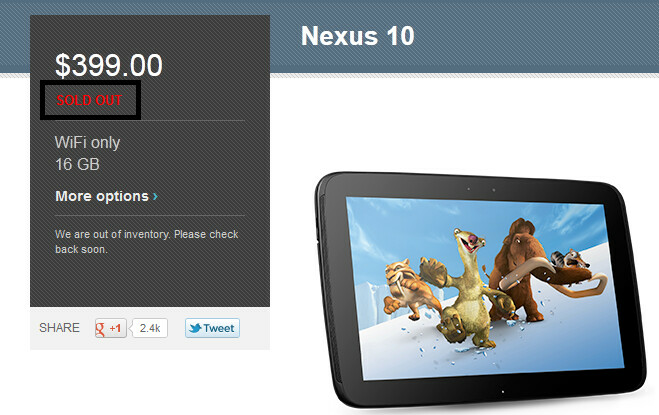 I knew that the new nexus devices will sell like pancakes! I don't mean to be a skeptic but now I'm ready to start seeing some sales figures and number of units sold soon, because this is starting to sound way too good to be true. But, if this is indeed true and these units have been selling at large quantities like crazy, a big "hats off" to Google. How about just one article stating that all new Nexus devices are sold out, I mean it's pretty inevitable at this point. That is pretty neat, I'm looking forward to more nexus smartphones and tablets in the future because it's only going to get even better. The Nexus N7 design looks way much better. This N10 has curves.